I’ve been told that Slade House is shorter and simpler than David Mitchell’s other work – a sort of Mitchell Lite companion volume to The Bone Clocks, and also full of references to characters in the rest of his books. 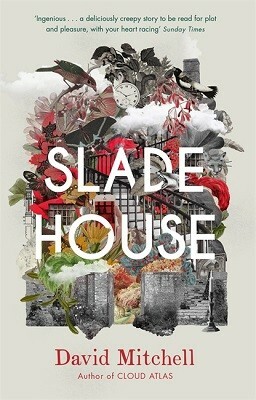 However, Slade House is the only one of Mitchell’s books I’ve read, so I can only judge it as a standalone novel. I would describe Slade House as a horror novel, albeit a relatively literary, thoughtful one, and not one that I personally found frightening. Slade House itself is a mysterious residence which only seems to be accessible every nine years, when a featureless doorway appears in an alley way to particular individuals. What they find there differs from person to person, and seems to be tailored to their particular needs. A lonely boy who struggles to fit in with others finds a friend of his own age who doesn’t think he’s a weirdo, while his mother, a musician, is introduced to Yehudi Menuhin. A recently divorced policeman is seduced by a beautiful woman, and a shy student bullied about her weight seems about to begin a romance with the very boy she’s long admired from afar. What really lies behind the shifting façade of Slade House, and who are the mysterious brother and sister who appear in different incarnations each time the house appears? Each character’s section of the narrative has echoes of the one before it, and each character seems to suffer a similar fate which means the plot is by its very nature episodic and somewhat repetitive. The characters themselves are engaging enough to keep things interesting, with each one being a believable victim. Some are likeable (the young boy at the start) and others less so (the wife-beating copper). Each is very much of a type and, as such, perhaps lacking in complexity, but the nature of the plot means we have to get the measure of them in a very short time so I think this actually works successfully. Less successful, for me, are Norah and Jonah, the brother and sister behind the evils of Slade House, and their back story. Far too often Mitchell has them deliver exposition by telling one another things in great detail that they would already know, and while I suspect this is intended to be pastiche; I don’t think it works. Their history is largely explained in a single chunk towards the end of the story and is the least interesting thing in the book. When it comes to humour and horror, Slade House is best when it’s subtle rather than over-the-top.